As a subscriber of Value Investor Insight (“VII”) (I previously wrote about in this post), which serves as my learning tool and an avenue for idea generation, I have also found the newsletters useful in that it acts as quick reference when I chance upon a potential opportunity. For example, if I come across a company such as Hertz hitting its 52-week high/low or it appears on a 13F, etc, and I needed a quick understanding of what credible investors have thought about it, I could look through VII and trace an investor’s pitch on it. That provides some context and short circuits the preliminary work to be done. The only problem is that VII does not seem to have an available list of all companies that were ever featured in the newsletters. That means one would have to look through each copy manually or rely on memory as to whether a company was mentioned. To solve that problem, I rolled up my sleeves and pulled out the companies’ names and month the newsletter was published, and dumped them into Google Sheets. It was a little tedious but with some spreadsheet shortcuts, that alleviated some of the heavy lifting, and I believe it will be rather worth the time and effort when the list is required. I have done up the list between October 2016 till January 2012 – 5 years. The first issue of VII goes all the way back to 2005. I will try to continue pulling the data out till the very first issue and update the sheet accordingly. For those who are keen, I’ve kept the list public and can be viewed below. It can also be found under a new section in the navigation menu – Resources > VII Featured Investments – for ease of reference. The day before the presidential elections when Trump was declared President-elect of the USA, I went through an internal struggle on whether to hedge my portfolio. A significant portion of my portfolio is denominated in US Dollars (“USD”) and the stocks are listed in the country. I believe that for most of the people residing outside of the US, they would have hoped for Clinton to win the elections. The prevailing view appeared ot be that a Clinton administration would bring about stability to the global markets. However, hoping versus reality are 2 very different matters, as I found out for myself when Brexit happened. I didn’t think the UK would leave the European Union but it didn’t matter what I thought. The votes spoke for themselves and the British did vote to leave, never mind the current on-going twists and turns with the British government and the courts’ fight over bringing the ‘Leave’ decision to the parliament. Given that I had a fair percentage of investments denominated in British Pounds (“GBP”), I was caught with my pants down when the value of the GBP dropped against other major currencies. Needless to say, I did not hedge my positions prior to Brexit and had to watch my stock positions in the UK and my excess cash held in GBP, crumble. The good news was that my largest GBP-denominated position was YouGov. 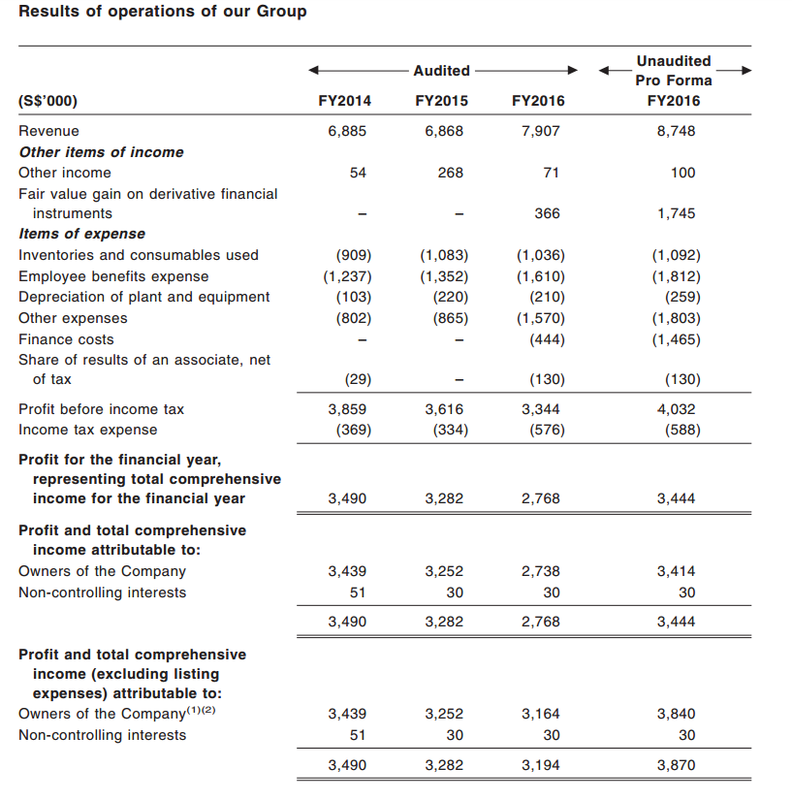 As a large portion of YouGov’s business were derived from outside of the UK, coupled with good financial results during the subsequent quarter, the rise in its stock price more made up the currency devaluation over time. This was definitely attributable to good luck, with zero skill involved. This time around with the potential prospect of Trump being the 45th President of the United States, I converted my remaining excess cash denominated in USD into my local currency to avoid the same from happening again. I hedged a portion of my USD and US stock exposure by buying a gold instrument. This is the first time I have ever bought anything that is closely related to gold, largely because I am in Warren Buffett’s camp – in that he says gold by itself doesn’t produce cash flow and doesn’t have intrinsic merit. I agree with him that over the long-term, gold can’t compound value the way businesses can. I very much doubt he owns gold or its derivatives. However, where I take different approach and depart from this, is that I believe gold can be a good protector of constant value over the short-to-medium-term, particularly in times of uncertainty, such as these Brexit and Trump-entering-the-White-House events. As such, I will only utilise gold in my portfolio very sparingly an in rare occasions. Anyhow, the US market (both stock and currency) did not react as violent as I or most other people thought. In fact, the S&P ended up a 1.11% higher on 9 Nov 2016 and most of my US-listed stocks turned out OK. The very next day, Asia markets rebounded strongly, with the largest gain coming from Japan, where the Nikkei 225 rose 6.72% and Nippon Paint (a stock I own) jumping 8.73%. To be fair, the Nikkei 225 was also among the largest losers the previous day. Thus, the strong rebound was pretty much a catch-up. With gold price coming off in the past day, I am a couple of percentage points down on my hedge while on a portfolio basis, the cost is less than half a percentage point. I still think the insurance was absolutely necessary. Although it ultimately wasn’t necessary in the end, it served its purpose well and helped me get through the day with much less worries. “I think there is a difference between Brexit and US elections, and hence a difference in market reaction. Brexit is directly an economic event (Britain leaving an economic bloc). I came across 2 videos from The Manual of Ideas this morning that provided some good food for thought. Good points for me to take note of in terms of idea generation and further systematising my investing approach. The first was on Wesley Gray of Alpha Architect. In it, he talked about how as part of his dissertation for his PHD, he back-tested the results of one the great idea repositories which happens to be an open secret of the investing world – Joel Greenblatt’s Value Investor Club (“VIC”). He noted that the back-tested returns of ideas on small cap stocks, written-up by investors in VIC beat the market. I visit VIC periodically over the years but have not done so recently. That there is empirical evidence to show value investing works is definitely good news and backs up what most of us already know – that the efficient market hypothesis is really just a hypothesis. VIC is an exclusive club (actually, it’s more of an old school message board) where value investors globally pitch their ideas on the platform and the ideas are then rated and commented on by other members. To gain membership, a would-be member has to post an idea. The idea is then reviewed and if it is deemed good enough, you get admitted to the hallowed walkways of VIC where many of the top investors across the world are members, though they are typically anonymous on the message boards. It used to be that the membership count is capped at 250 and those who do not contribute a minimum of 2 ideas (but has to be less than 6) annually were pruned from the club to keep the quality of the ideas high. However, the cap of 250 may now have been removed, according to Whitney Tilson. The good news is that even though it is hard as hell to gain membership, the ideas from admitted members are available on a lagged basis. While admitted members can view new ideas in real time, the public can only view them but on a basis of a 45 days lag time. Since VIC isn’t exactly a momentum stock chasing idea forum, but rather, a more long-term idea sanctuary, the 45 days lag usually isn’t too big of an issue for the public. I submitted the Billabong idea on VIC about 3 years ago and it was a bummer I didn’t get in. On the bright side, the idea made me good money so I can’t really complain either. 🙂 Anyhow, I’m glad I came across a mention of VIC again and will surely visit it on a more regular basis. In my iPhone’s calendar, I have just set a recurring reminder every 2 weeks, to visit VIC. In doing so, I hope to read more, learn more and and hopefully find some great new ideas. The second video featured Christopher Crawford of Crawford Fund Management. In it, he described how he and his team stick to a fairly disciplined investing framework. The process is systematised, particularly on the qualitative aspects of opportunities, which are individually force ranked. Investments currently owned are also force ranked. Ultimately, he is seeking a portfolio that is weighted by investments that has the combination of the greatest upside (attractive thesis), high on qualitative scores and importantly, those with lower spectrum of variable outcomes. In other words, opportunities that are both attractive and has certainty of outcomes make the cut. Crawford’s idea of having a set framework to help guide the investment process appeals strongly with me. Very often, I see how friends jump on investment gravy trains without having a clear thought process and set criteria that governs qualitative and quantitative aspects of investments. I used to be lost when deciding which investments to make but over the years, it has gotten much better as I institutionalise the key aspects to look out for when assessing current investments, potential opportunities, position sizing and entry points. I am still trying to improve on my process everyday. My buy order for HC Surgical at S$0.371 per share, which was put through last night failed to go through when the opening bell struck at 9am this morning. Boy did it fail. The stock opened at about S$0.550 and closed at the same price at end-day. That represented slightly more than 100% of gains in a single day, up from the IPO price of S$0.270. The whopping return is great news for investors who managed to get their hands on the placement tranche. 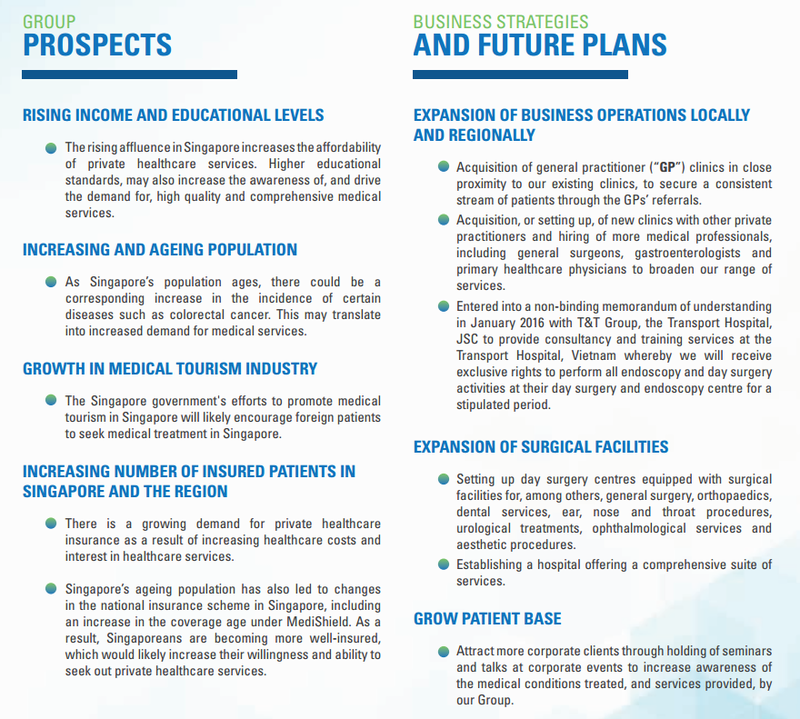 As for me I’ll just have to hold on tight, await for better opportunities especially if HC Surgical’s stock price falls, and reassess HC Surgical when there are new developments with the business. I read a couple of newsletters on a monthly / quarterly basis to get new investment ideas and to learn more about the thought processes behind some of the best in the industry. My favourite is Value Investor Insight (“VII”), which is co-founded by Whitney Tilson of Kase Capital. The VII format interviews several fund managers in the value and growth investing circles on a monthly basis, where the interviewees share their history, investment philosophy, processes and the thesis behind a few current ideas they are vested in. The newsletter is usually less than 20 pages long and the drawback to VII is that it is a paid service. However, considering the value I extracted from it, the price of the newsletter has been paid many times over. It was from VII’s Sep 2013 issue which interviewed Jim Larkins of Wasatch Advisors that I found Ebix as an idea that turned out to be a really good investment. Sapiens was another which I found in VII and invested in. The idea was pitched by Ori Eyal in the Aug 2016 edition. Another newsletter I read is ROE Reporter by noted Canadian investor, Jason Donville. It is published free on a quarterly basis and he covers his thoughts and the stocks within his portfolio. I first came across the newsletter in February 2016 and more recently, read an interview with Donville in the wonderful book that profiled Canadian investors – Market Masters – by Robin R. Speziale. Donville’s philosophy is that ROE is probably the single best indicator of whether a company is going to be a great compounder. In the newsletter, he ranks listed Canadian companies by highest ROE and lowest P/E ratios in his list of shortlisted opportunities which somewhat reminds me of Joel Greenblatt’s much talked about Magic Formula. Although the newsletter is usually just a couple of pages, I enjoy reading them and am going through the past ones currently. In the last one year, his fund has taken a drubbing from his stock picks such as Concordia (the smaller version of Valeant) and Home Capital Group. Both have high ROEs and are highly leveraged (Home Capital Group’s business is in mortgages) but each have their own set of unique problems that contributed to their downfall. The underlying lesson for me is that while debt may not be the single factor that kills you, it is what will fuel the flames to spread across the rest of your business if any part of the business blows up. That said, Donville’s long term track record remains good and I am sure he will bounce back from this. It was from ROE Reporter that I found an investment opportunity – CRH Medical Corporation, a Canadian company in the gastrointestinal part of the healthcare industry, more specifically in the treatment of hemorrhoids and provides anesthesia services. The other free newsletter I read on a quarterly basis is the excellent Graham & Doddsville newsletter, an investment newsletter from the Columbia’s Student Investment Management Association (Columbia Business School). The name of the newsletter is of course a play on the term used by Warren Buffett who wrote the seminal letter in 1984 called ‘The Superinvestors of Graham-and-Doddsville’. In each issue, the newsletter profiles investors, a number of whom are alumni of the mecca and school of the original value investors – Columbia Business School, following which the newsletter sometimes include stock pitches by current students. It is a great read each and every time and at about 50 pages for each issue, holds plenty of wisdom and investing nuggets for readers. I hope you will enjoy reading the above mentioned newsletter as much as I have. If there are any great ones, do feel free to share! A micro-cap IPO is being launched in Singapore and is expected to be listed on 3 November 2016. The company in question is HC Surgical Specialists Limited (“HCSS”). As I have mentioned previously in a post on Advancer Global’s IPO, I almost always avoid IPOs but HCSS’ pricing gives a lot to pause for. The valuation seems undemanding, especially when compared to its peers in the healthcare sector listed on the SGX, which are trading at obscene multiples. The key details extracted from the Offer Document, which can be found on here, are as per below, which would paint a picture of why I believe it is rather undervalued and represents a good opportunity to mop up some shares. That is if I can even get my hands on it on the day of trading, given that the IPO is a full placement – no shares offered to the general public via balloting and there is a strong likelihood the share price will shoot up so quickly at the opening bell it won’t make sense to buy at an elevated valuation. Below is a quick and dirty assessment of the IPO, the business and its valuation. The tax rates for FY2014 and FY2015 were abnormally low due to tax incentives which may not accrue going forward. To be conservative, I would adjust the profit for both years by the normalised and standard statutory corporate tax rate of 17%. In addition, government grants under ‘Other income’ may not be a guarantee going forward, and as such, should be deducted to normalise historical earnings. Deducting the government grants and applying the 17% tax rate would mean that FY2014’s and FY2015’s net profit would have been S$3,168,974 and S$2,792,090 respectively. The company incurred listing expenses of S$430,000 which will not be repeated in future years (other than in FY2017 as the IPO crosses over the time period). It also generated fair value gain on derivative financial instruments of S$366,049 and finance costs of S$444,029 arising from its redeemable convertible loan which are non-recurring (other than in FY2017 as the IPO crosses over the time period). By normalising the above 3 components, deducting government grants of S$52,683 and applying a 17% tax rate, we would arrive at FY2016’s normalised profit of S$3,153,694. To have a rough gauge of how the numbers are going to look like going forward, I take the pro forma numbers up till the profit before tax line of S$4,032,259. This figure assumes acquisitions done after the FY2016 year end (31 May 2016) were taken into account, among other line items as per the adjustments above. Some figures that need to be adjusted include the total fair value gain on derivative financial instruments, finance costs, listing expenses, government grants as mentioned in the previous section’s ‘Normalising FY2016’s figures’. In addition, there will be expenses incurred in relation of HCSS being a publicly-listed company. These include director fees, Catalist sponsor fees, fees payable to SGX, etc. For larger businesses, there is often sufficient buffer to take on those costs, but since HCSS is in the micro-cap space, let’s have a quick look as to whether it will create a large enough dent in earnings to warrant attention. There will definitely be additional costs involved such as the printing of fanciful glossy annual reports and booking of function rooms and catering for EGMS and AGMs. I assume setting aside S$50,000 per annum should be sufficient. Adding all the items up, we have ongoing costs of about S$425,000 per annum. 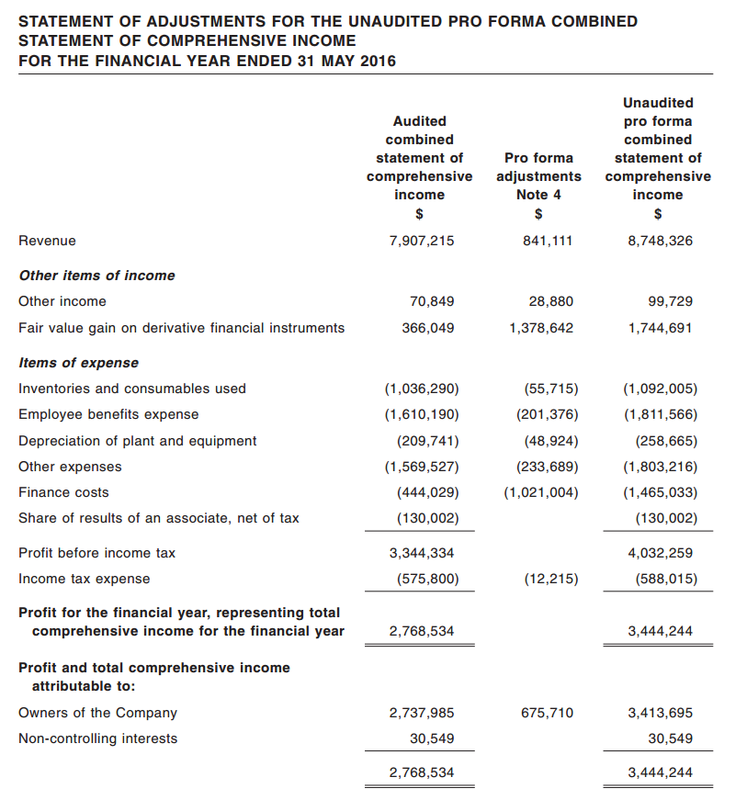 Assuming all other revenue and costs stay the same for FY2017 and adjusting for all the line items mentioned above, we get a profit before tax of S$3,704,918 while net profit based on a 17% tax rate gets us to S$3,075,082 or 2.10 cents per share (based on post-Placement shares of 146,311,530). There doesn’t seem to be much of accounting gimmicks, given that operating cash flows have exceeded net profit in FY2014 and FY2015 out of the last 3 financial years. 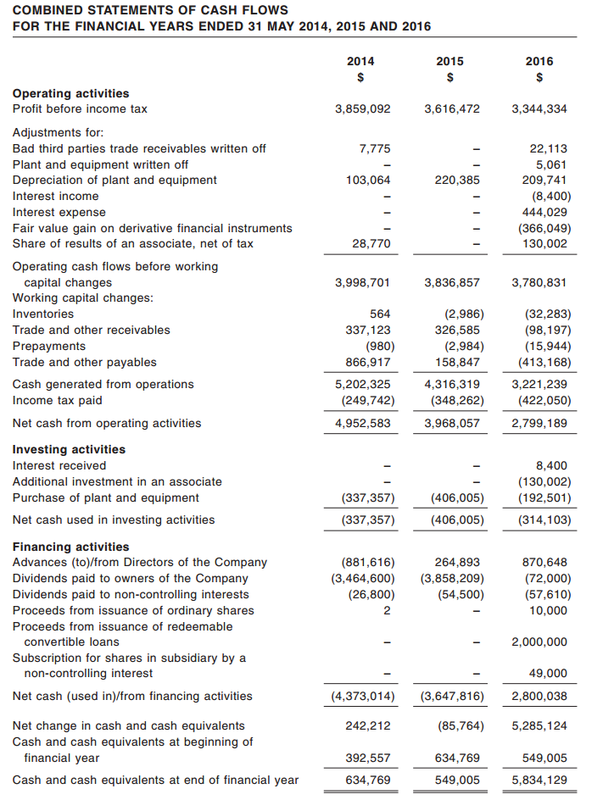 The reason it dipped below net profit in FY2016 is due to changes in working capital which isn’t much of a concern in this case (specifically payment of trade and other payables). Capital expenditures are rather reasonable at S$337,357, S$406,005 and S$192,501 respectively for FY2014, FY2015 and FY2016 respectively compared to close to 10x the operating cash flows the business generates. The average free cash flows across the 3 past financial years match very closely to that of the average net profit – a good sign of investors’ ability to rely on the income statement. My initial guess is that the nature of the medical business is such that it doesn’t have to employ much capital to generate good returns since most of the work done or value stems from the intangible skills and reputation of the doctor. The quality of tangible equipment definitely plays a part but I would argue that the importance of the person utilising the machines ranks higher. Clearly, HCSS is a superior business given that it doesn’t need much invested capital and runs on negative invested capital in FY2015 and FY2016 to operate and churn cash out. That pretty much leaves ROIC (normalised net profit) for FY2014 as a ridiculous 751% while not being applicable for FY2015 and FY2016. The moat appears to be intangibles – brand, which is pretty much dependent on the doctors’ skills and reputation. I don’t exactly like the idea of the main moat being dependent on the persons running the show, which in this case appears to be Dr Heah and Dr Chia. If they get hit by a bus, would that effectively mean game over for the business? The good news is, there are 2 other surgeons within the group, 4 external surgeons who run their own practices with fee-sharing arrangements and 2 other general practitioners. I wouldn’t say the moat isn’t strong for now, not until they have created a brand name for the practice that will outlive the reputation of the individual doctors (think the Mayo Clinic, Q&M and Raffles Medical). The Offer Document listed ‘we have multiple clinics located in highly accessible locations’ as one of its competitive advantages. I personally think it is a nice to have but would not represent a strong advantage. Granted, the operating costs are lowered given the cheaper rental in the heartlands where HCSS has a presence but it represents just 3 (Hougang, Bukit Batok and Tampines) out of 11 facilities on hand. The rest of the facilities are in the usual higher rent central hospitals like Mount Elizabeth and Gleneagles. In addition, my opinion is most people will view specialists located in top notch and well-known medical centres as much more reputable and are willing to pay the premium that comes with it. After all, medical expenses are not exactly line items you would want to cut down on when it concerns your health. I would even argue that having a specialist clinic located in the suburb may lower the brand equity of the overall group. I generally agree with the prospects and growth plans wise, in most cases I discount it a fair bit, particularly on overseas expansion in Vietnam since that also brings a whole set of risks. I would say for businesses such as this where it’s practice-based rather than owning a hospital outright which provides a certain untapped capacity to grow the business, more often than not, a rollup strategy to acquire other practices is likely to be the name of the game. There are only so many patients a doctor can perform on a procedure a day. In other words, it doesn’t quite have the economies of scale in the sense of the scalability that allows software companies make money. Granted, the roll up strategy is riskier than organic growth, it isn’t too bad a strategy and the nature of the business sort of forces the dynamics of a rollup strategy. After all, with all the gushing operating cash flow generated by each practice and nominal maintenance capex requirements, the only logical way to grow the business is to deploy capital to acquire other practices and using the currency of its stock to attract targets. Based on the market capitalisation of S$39.5m and assuming revenue and costs stay constant while HCSS incurs expenses as a listed company – net adjusted profit of S$3,075,082 or 2.1 cents per share (based on post-Placement shares of 146,311,530), the price to earnings (P/E) ratio would be 12.8x. Enterprise value (EV) based on the pro forma balance sheet which has S$5,194,000 of cash and net cash proceeds raised from the IPO of S$6,147,000, equates to S$28,159,000. On an EBITDA basis, HCSS generated S$3,971,983 or 2.7 cents per share which gives rise to an EV/EBITDA ratio of 7.1x. With S$4m or 65% of the net cash proceeds earmarked for expansion, HCSS’ business will most certainly grow over the short-to-medium-term, though I am not taking it into account at this point. If we look at HCSS’ peers as per below, based on the figures as at 30 Oct 2016, we can see that HCSS compares very favourably in terms of the valuation multiples. The above peer valuation chart was extracted from KGI Frasers’ initiation report on Health Management International, dated 20 July 2016. Although it is slightly dated, it serves as a quick and good-enough comparison of HCSS’ peers and their valuation. This is since most of its peers’ stock prices have been stable (+/- 5%), sans Health Management International, Singapore O&G and Healthway Medical Corp which have risen much higher in price (which means the multiples are higher), while Cordlife was the only one that declined more than 5%. As can be seen from the table, the average P/E and EV/EBITDA ratio for the peers, both on a historical (28.0x and 28.6x respectively) and forward (29.2x and 19.7x) basis are miles higher than HCSS’. The direct comparison isn’t exactly accurate since there could be parts of each company’s financials that should be normalised like how my calculations for HCSS was normalised, different capital structure and ROICs generated. Nevertheless, it gives a pretty good gauge of how underpriced HCSS is for the impending IPO when the averages are compared to HCSS’ P/E and EV/EBITDA of 12.8x and 7.1x respectively. Some of the peers’ multiples are relatively high and I would be more comfortable taking the average of the 3 lowest peers’ multiple to perform a quick and dirty price calculation to purchase HCSS, without going into a detailed DCF valuation. On an average forward P/E and EV/EBITDA ratios basis, the average of the 3 peers’ with the lowest multiples are 19.6x and 14.5 respectively. When applied to the HCSS’ adjusted earnings and adjusted EBITDA per share, it would translate to 41.2 cents and 39.2 cents respectively. Given the clean balance sheet, high ROICs, zero debt, and the simple nature of the business, I would be comfortable with a lower margin of safety of 10%. In other words, my assigned buy price would be about 37.1 / 35.3 cents and below. Following the IPO, the management team will continue to hold a substantial stake, representing nearly 70% of shares outstanding. Health-related fields have a certain degree of pricing power, although from time to time, excessive fees charged by doctors and surgeons scrutinised by the regulators. It’s not something I am excessively worried about. My opinion is surgeons’ skills are highly specialised and regulated, and the chances of their livelihood being disrupted by technological change are much lesser than a typical pencil pusher sitting behind a desk. The relatively low capital expenditures on medical equipment as compared to the revenue and operating cash flows generated appears to be a good gauge of this. HCSS isn’t the first medical-related company to go to IPO with such low valuation. Singapore O&G Ltd, a medial group specialising in obstetrics and gynaecology, was one such IPO. With an IPO price of S$0.25 backed by a low P/E ratio of 9.9x then, it surged 156% to S$0.64 by the end of the first trading day on 4 Jun 2016. Separately, a recent underpriced IPO, Advancer Global which I wrote about prior to their listing and had a P/E ratio of 7.2x, jumped 77% from S$0.22 to S$0.39 on the first day. The following reasons are more of why they are going for an IPO than why the shares are underpriced. While on an optical basis, profits have been declining over the past 3 years (without normalisation), it is still a reasonably good business with profit margins in excess of 40%, in a relatively resilient industry. While I am not too psyched up about its growth, the underpricing makes it an attractive opportunity to accumulate shares below 37.1 / 35.3 cents cents per share, providing a margin of safety of 10%. The only thing left to do now is to await for 3 Nov 2016 and see how things go at the opening bell at 9am, to see if the price range is within reasonable limits to purchase some shares. I certainly expect a sharp price increase but will be keeping my fingers crossed nevertheless.